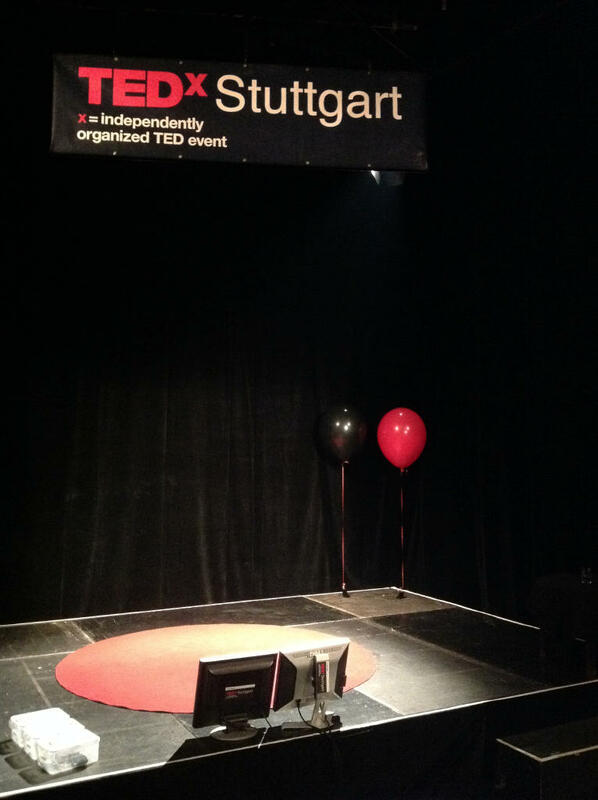 We've organised 3 TEDx events in Stuttgart so far and I've been involved with all of them, mostly in the interaction with our speakers. So here are some first lessons that I've learned from these 3 events. These are mainly aimed at other organisers (not necessarily restricted to TEDx events) but if you're a speaker, you may also want to take a moment to think about them. This is really only an issue if your event is held in a country where English is not the native language. Since all TEDx talks are recorded and uploaded to YouTube (which is actually a requirement, as part of the licence from TED), some speakers opt for speaking in English, thinking they will reach a wider audience that way. First of all, think of the local audience - the people who are in the room at the event. How many of those do actually speak English? Isn't it more important for the speaker to connect with this audience, at this moment, than with some abstract audience out there? Also remind them that there are a lot of TEDx events happening. Their talk is just one of many that are uploaded each week. The actual audience "out there" may be smaller than they think. And then there's the question: How fluent is the speaker in English? From experience, we'd rather have a good talk in German than a mediocre one in English, just because the speaker isn't as good in English as they think they are. So this is something that an organiser should watch out for and discuss with the speaker. If in doubt, arrange a rehearsal - just a short sequence about their topic should do; it doesn't have to be the entire talk yet. Often, speakers with an interesting topic are also very busy people. We've found that working with these people can sometimes be hard. You may end up in a situation where the speaker just treats your event as yet another talk they have to give. "Yeah, there's that funny 18 minute limit; no problem, I'll just cut down my usual talk to that length - it'll do." That's not the sort of talk you want at a TEDx event. Some of our speakers have put months of work into their talk - and it showed. This isn't to say that you should rule out busy speakers from the start. If they have an interesting topic that would be a good addition to your event, then work with them. Explain to them how TEDx is different from their usual speaking gig. Convince them to make room in their busy schedule for proper preparation. Show them examples of good TEDx talks from related fields. And accept that maybe it's just not going to work out this time. If the speaker sees that you'd rather push them to a future event, that may get them thinking. Finding the best length for a talk is not an easy task, as it depends on the topic, the speaker, and a lot of other factors, such as their place in the schedule. It's usually a good sign if the speaker themselves suggest a length below the 18 minute limit. It means that they already have a good idea of what to present and how long it'll take them. It also indicates that they "get" the TEDx format (as opposed to speakers who ask for 18 minutes mainly because it means getting as much time as possible). Talks evolve over time and what the speaker had in mind originally may not work out the way they thought it would, so it's not uncommon for speakers to ask for more time. Obviously, you want them to give the best talk possible, so it's tempting to give in. I'm not saying that it's always wrong, but I'd suggest being cautious and to check with the speaker why they think they need more time and what they plan to use the additional time for. As an example, we've had a speaker who presented a really strong talk during a rehearsal and then asked for more time to make it even better. Since things seemed to go well, we didn't question this. The result was still a good talk, but it was less focused than the version we saw during rehearsal. In retrospect, we should have seen this coming. Sometimes, speakers get too obsessed with making their talk "perfect" - and it's your job, as an organiser, to detect this and stop them. The old adage "less is more" still applies, even in a format like TEDx, where the length of the talk is already "less" than at other events. "3 Lessons learned from organising a TEDx event: Speaker Selection and Interaction" by Dirk Haun is licensed under a Creative Commons Attribution-ShareAlike 4.0 International Licence.